On July 10th, there was a hotly contested City Council meeting to discuss the much publicized motion by Councilman Lalloway regarding the use of the ARDA site for the Cemetery given the resounding defeat of Measure B by the vast majority of Irvine residents. In another display of complete disrespect by our Council, Mayor Wagner put forward a 6 point motion. Did he construct this motion right there on the dais? No. It was typed up and ready to go. Did he present this option for review by the public in accordance with the Brown Act? No. Let’s examine the timing. Was sent to CC on June 12, 2018, (almost a month prior to the July CC mtg.) via email to acting city manager & CC. The memo is a pretty basic five prong motion. The document was included in the 7/10/18 agenda packet and available on the city website prior to the CC meeting. The public had access to view the motion before the meeting. The Brown Act was followed. July 10, 2018, introduced from Dias in CC meeting. 6 point motion with detailed sub-requirements for each point. The public was not given the opportunity to see the motion and thus could NOT comment on the motion in public hearing. Is this a brown act violation? If no – this is a standard operating procedure for the gang of 3. – Wagner, Shea and Fox? NO TRANSPARENCY. See the picture below of Wagner’s motion taken just after the meeting. Why wasn’t this posted in advance?? How come Shea and Fox were so eager to vote for this? Did they have advanced knowledge? And the $64,000 question – why wasn’t the option of the Golf course put forward a year ago instead of delaying the cemetery for yet another year. 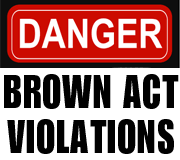 BROWN ACT VIOLATIONS? Documents at meetings are meant to be public and posted in advance. Given the detailed sub-bullets, the WatchDog would LOVE TO KNOW WHO DRAFTED THE MOTION. Is the City Attorney complicit in this Brown Act violation as well? We are certain that these questions will also be met with deafening silence from our elected officials. Good question! Why wasn’t the Mayor’s motion provided with the agenda? Clearly it was prepared before the City Council meeting. For those of us that don’t follow Inside Baseball, what happens when someone doesn’t follow the Brown Act? A knowing violation of the Brown Act with the intent to deprive the public of information to which it is entitled is a crime. Unfortunately, without much money, the public doesn’t have much in the way of power to enforce the Brown Act. In reality, it should be incumbent on our city attorney as a check and balance into the system to keep our elected officials beholden to our laws. Unfortunately, he doesn’t seem to be interested in doing that and our elected officials simply continue to stomp all over the voters and residents. We can only recall and/or vote them out.